Always wipe down the strings and all of the oud gently with a soft, clean cloth after playing, especially after you've played a long time. This will help preserve the strings longer, as well as the wood. A clean instrument is a great sounding instrument. To really preserve your strings and keep a strong, constant tone, do the following: Spray a very small amount of "Finger-ease" on a soft cloth and, avoiding the soundboard area completely, pinch each string and slide up and down cleaning with the applied area. Afterwards, wipe down the strings with a dry part of the cloth to remove any residue. It's also recommended that you do this to brand new strings before putting them on the instrument, removing any chemical treatment they have had from the factory. This spray works on all types of strings for all instruments. Every time I change my strings (about every 6 months or so) I apply some "Hill" brand peg compound that you can buy at any violin shop. I apply a little around each peg at the two "rings" where it is visible the peg contacts the pegbox, then I rub a little "Ivory" brand soap (99% pure soap) onto the applied peg compound which will then mix together for a smooth yet stable turning peg. You may notice black marks on the face of your instrument under the treble strings where the neck meets the face, and also above the pickguard if you are picking above that area. This can be safely and easily removed using Naptha (cigarette lighter fluid, i.e. Zippo). Just apply a little Naptha to a soft cloth and rub the area with the mark/stain along the grain. This also works well for marks left by pickup/microphone adhesives you might use to amplify your oud. It is the safest and easiest way to remove marks and stains from finished or unfinished woods, and evaporates within a few minutes leaving a clean, almost new surface. You should never attempt to put any oils or finishes on the oud face unless you are sure you know what you are doing. It will stain permanently, and possibly negatively affect the oud's sound (it will probably require sanding to remove). Never leave your oud in the car, in the sun, by a heater, anywhere it might be exposed to too much heat, cold, sunlight, etc. Extremes are bad for your instruments. Keep an eye on the humidity. Too much or too little is not healthy for the woods on your oud. Try to keep it around 40-60% or so. Always have a hard case for your oud. You would make your child wear a seatbelt wouldn't you? Protect your oud(s) too, they deserve it. It doesn't hurt every few years to have your oud examined by its maker, or by another experienced luthier/oud maker for a 'check-up.' This is especially true for older instruments. Finally, to get the best sound out of your instrument(s), play often! Riq, Mazhar, bendir, Tar... Lover / Riq Lessons from Randy Gloss! Before You Start: There are two main playing positions for this instrument. They are commonly referred to as the Cabaret style and the Soft style. these lessons deal only with Cabaret style. 2. rest the Riq into the C with one set of jingles facing down through the middle of the C.
3. Bring your thumb (bottom half of C) up to push against the back jingle. 4. Your forefinger and possibly your middle finger will hold the Riq where the skin meets the shell. 5. Moderately tilt the drum forward to rid yourself of any unwanted or excess shimmer of the jingles. 6. Your right hand will be used to play drum sounds in this position. Unlike other styles of frame drumming, your right hand should not rest or pivot off the shell. Keep it free to move. 7. Likewise, your left hand will be used (along with your right)to play the front jingles in your C. Use your ring finger in each hand (on that same jingle). Practice altenating right-left-riight-left for awhile, to get the feel. Ney, Kawala Lovers / Is learning the Ney different from learning the Kawala? I took lessons on the Kawala for a few months before moving to another state. Before moving I ordered a Ney from Turkey with plans to have lessons on it. Now, I'll probably be on my own trying to learn to play it. Is there a difference in playing the two flutes? I know the Ney has a whole on the bottom of the flute whereas the Kawala does not? Darbuka, also known as doumbek (or tumbak), or derbeki, is a Middle Eastern percussion instrument. The goblet-shaped single headed hand-drum is an ancient drum. It was originally played in Egypt, Armenia and Turkey. The darbuka is considered to be the leader of percussion instruments in the Middle East. The origin of darbuka has its roots in the Oriental music, where distinctive rhythms are quite common. However, in the latter years, Darbuka made its way into Western music. Authentic darbukas are home made and are made of clay or wood with goat skin stretched over the top using rope, leather thongs or nails. 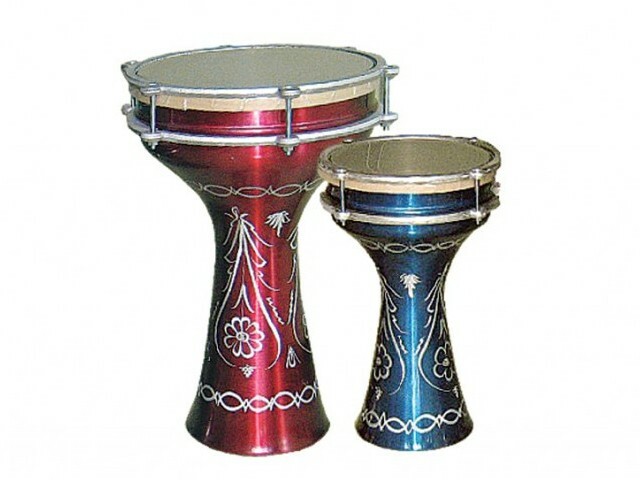 Contemporary versions of darbuka may also use aluminum or copper with synthetic fibres for the drumming surface. The fact that the drum is single-headed distinguishes it from other musical instruments of the family, such as the tabla, dhol and pakhawaj. Since the instrument has a long history of being used for belly-dancing music in the Middle East, it is also referred to as the belly dance drum. The first known western classical composition to feature a goblet drum is the opera Les Troyens by the French composer Hector Berlioz, which calls for a tarbuka in the Dance of the Nubian Slaves in Act IV. While the first compositions for goblet drum and orchestra were composed by Halim El-Dabh in the 1950s. His Fantasia-Tahmeel for goblet drum and strings was premiered in New York City in 1958, with a string orchestra conducted by Leopold Stokowski. The body of this musical instrument is made from fish or skin of the goat. Traditionally, it was made out of clay. According to most of the people, darbuka resembles the African Djembe. However, nowadays, Darbukas are seen to be consists of metals, such as, copper, brass, aluminium, whereas, the skins are seen to made out of plastic. But, sometimes in order to produce a deeper sound, natural skin is also used. While playing this instrument, the musician usually places the drum on his knee. However, in the past, while performing players use to place this instrument under the arm. Apart from all these, there is a wide range of techniques, following which this drum can be played. This technique differs from region to region and varies on the basis of the material the instrument is made from. There are mainly 2 types of goblet drums. Among them, the Turkish style exposes the edge of the head, whereas, the Egyptian Darbuka style features rounded edges around the head. Though, this instrument was invented long years back, till now people love to listen to its melodious tune. In this lesson of Learn Oud 1 course for beginners , you will meet your instructor Tareq Al Jundi and you will learn about the main instrument in Arabic Music , the different parts of the Oud (Tuning Pegs , Finger Board, Sound Box , Oud strings names , Oud Pick or Risha ), how to hold the Oud , how to hold the Risha , how to pluck the Oud strings and the best position for the Risha, tuning the Oud strings , a brief about the difference between Arabic and Western Music : Quarter tones. Lesson 2 of Learn Oud 1 course, explains Time Value in Music (semibreve, minim, crotchet, quaver, semiquaver, demisemiquaver, hemidemisemiquaver or whole note , half note , quarter note ..ect) , Music staff, Treble Clef, 4/4 Time Signature, Measures, Bar Line and other terminology that you will need in Learning the Oud throughout the course. Tareq introduces the left hand for the first time in Learn Oud 1 for beginners. Advice on the position of the left hand fingers on the Oud’s finger board is given. Finger numbers (Thumb = 0 , Index = 1 ect ) , You will also learn how to produce the “B” note by pressing on the “A” string of the Oud. Exercises on playing these two notes are given with advice on the position of the finger on the figure board. Hello my name is Elizabeth, I am new to this forum, hope to get to know all of you members.